Motherhood. Career. Fitness. For many women, it doesn't always feel like all of these can coexist, much less find balance. But this Mother's Day, putting another word at the top of that list could make all the difference: self-care. Experts agree nutritious foods, physical activity, regular checkups and proper sleep are all important to your health. Former Olympians and current moms agree and offer their own personal twists. 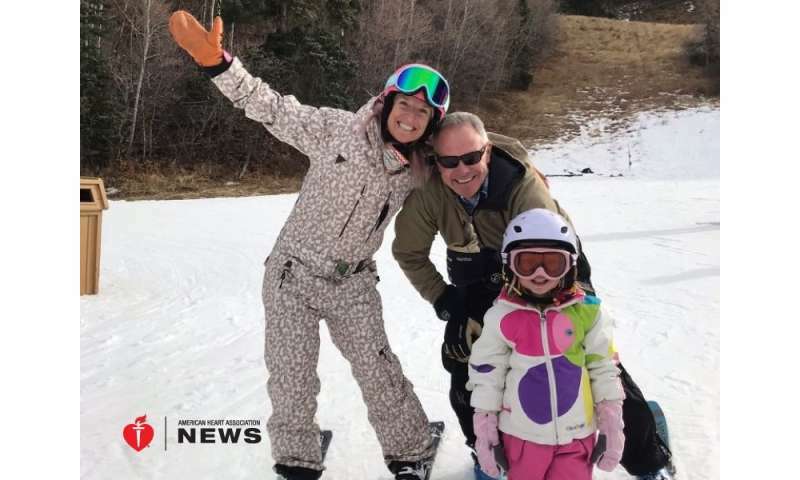 "I know how important being active every day is for your physical health, your mental health and your happy health," said two-time Olympic medalist and freestyle skier Shannon Bahrke Happe, who is due soon with her second child, a brother to 4-year-old Zoe. "We can always say 'I'm busy,' but you need to take time for yourself and to decompress. . . . For me, it all comes down to getting at least 60 minutes a day. You are a better mom when you do that; you are a better wife. I feel like I'm better in business when I do that." Happe, 38, runs a corporate motivational company and is the ski champion at Deer Valley Resort in Utah. She just finished a children's book, "Mommy, Why Is Your Hair Pink?" a riff on her pink locks and a way to inspire kids. "What is work-life balance?" she said. "I look to my athletic training. There has to be a goal. So, I had to set three goals. At the end of the day what can I look back on and say, 'Yes, I was a good mom.' And I do the same thing with business and then, with getting healthy or getting in the gym, what are those goals?" Happe, who earned a silver medal in 2002 and retired after her bronze in 2010, has had to carve out what self-care means to her in a post-Olympics training world. "Everybody has to define what that balance and what their win is." That "figuring out" is now a big part of what's ahead for five-time Olympian Kikkan Randall. Over the past few months, she: won Olympic gold; retired from a 20-year career in cross-country skiing; moved to British Columbia, Canada; and celebrated her son, Breck, turning 2. She's also president of Fast and Female USA, a nonprofit dedicated to keeping girls in sports through their teen years, when they are much more likely than boys to drop out. Leaving behind the days and weeks of all-consuming workouts, travel schedules and competitions will mean finding a new normal, she said. "Just this month has been really eye-opening. It's made me realize what I want to strive for in this next step," said Randall, 35. "I love how strong I feel, so I don't want to let that go. If I get that exercise dose every day, it makes me a better mom, a better wife and more fun for everybody. So, the challenge will be in some places being creative, being a good time manager, and using the skills from my career, planning things out and essentially creating a schedule for myself to fit things in. "After being an athlete for 20 years, now I have to learn to be a normal person," she said. "I'm so inspired and impressed with people who have been doing this for a long time. I am looking forward to getting advice." Melissa Villamizar, a 37-year-old certified personal trainer and fitness nutrition specialist, certainly can give some. After playing college soccer, she dove headlong into fitness and personal training. She works full time as a design and business strategist but is taking a break from her side fitness company to focus on her 4-month-old son. She said she pushed herself to exhaustion and illness after the birth of her first son, who is now 4. "I want other women and mothers to know that juggling life, training, work, family, etc., is really hard, but it's not impossible," Villamizar said. "But you have to get your priorities straight. I am anxious to get back to training others but have decided to wait until my new baby is at least 1 year old. "I want to be an example to people everywhere, that I practice what I preach," she said. "Exercise is critical to a healthy mind, body and spirit, but if you throw everything else out of balance to focus on that one thing, whatever that may be, you're doing yourself a huge disservice." Prioritize: Figure out what's important. Write it down, simply or in detail. Make sure to find a way to balance your priorities so you're not leaning too heavily in one direction. As mothers, we would all say our children are our No. 1 priority. But if we don't take care of ourselves, we can't take care of our children the way we would like. Commit: Once you figure out your priorities, you can think about how you want to accomplish each one. For instance, to accomplish the "body" goals I have for myself, I will commit to exercising a certain number of days per week. Be Flexible: Be prepared to change plans. On the days your planned workout isn't possible, take the kids to the park and let them run you ragged. You all get a workout and spend quality time together. Can't swing the park? Include movement in your daily life. Take the stairs at work (more than once! ), park farther away, keep your weights in your bathroom and get a couple of sets in when you can. Give Yourself Grace: As a trainer, my job is to keep people on track, not to allow excuses. But if you're missing workouts because of 14-hour workdays, sick kids and four hours of sleep then it's more important to shift your priorities and get some rest. This keeps you from overdoing it and protects your health. Nutrition Is Key: The better you eat, the better you feel, and the healthier you are overall. You are better able to juggle all the things we juggle as mothers with a clearer mind and body, and that fuel comes from healthy, nutrient-dense foods. "But of all the things that we do in clinical medicine, what is the single most important difference we can make to help someone live longer and live free of target organ damage? There's only one answer," he said. "It's to measure and treat blood pressure correctly."